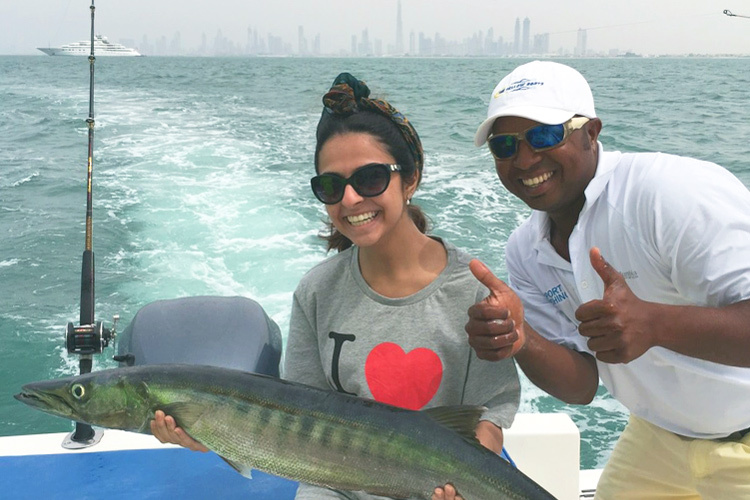 Award-winning Fishing Charters in Dubai! TYB Sport Fishing provides a professional fishing experience, offering the ultimate service for the novice through to the most experienced angler. Enjoy the benefits of custom-built centre console sports fishing boat. Our mission is to provide an exceptional fishing experience for anglers who crave deep sea fishing adventure while enjoying the most spectacular sights around the waters of the Arabian Gulf. Target a variety of species such as King Fish, Queen Fish, Barracuda, Grouper or Tuna using our best and most advanced sport fishing equipment and techniques. Great fun for the whole family or for those who are new to the sea and fishing. Learn how to fish or just take in the best scenery Dubai has to offer and experience some nearby wildlife. Your journey can be exclusive; just for you and your own hand-picked companions. Great for corporate groups, friends getaways or special occasions. Our boats come fully equipped with the best equipment, along with a team that has a wide knowledge of the local area. Try our delicious on-board BBQ! We believe in making a fishing tour with a difference and we can't do that without a great team of people. We love exploring the waters of the Arabian Gulf, and we know the best fishing spots intimately. Our fishing crew takes great pride in providing the best fishing experience and have tremendous local insight about the rich culture of the area and its surrounding waters. We provide a unique fishing adventure and offer top quality equipment and experienced fishing guides who will provide you with the ultimate experience. All bait and gear included and no additional cost. We are proud to maintain the highest safety and environmental policies on all our fishing boats and trips. We put safety above all else; that’s why an experienced and fully qualified team mans our boat. Our 34-foot fishing boat is equipped with the latest navigational equipment including Fish Finders, Radar, GPS, satellite radio for additional safety. We greatly promote catch and release in order to maintain fish stocks and a sustained future to sport fishing in the UAE. 6 am, 11 am, 4 pm. Other timings available on request.